A San Diego State University senior has become one of the winners of the prestigious California State University Trustee’s Award for Outstanding Achievement. 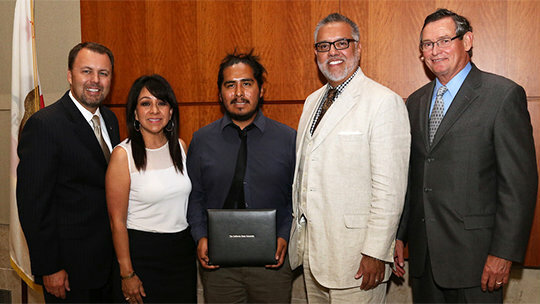 Sergio Juarez, who is studying mechanical engineering and making plans to become an entrepreneur, was SDSU’s nominee for the statewide prize, which is judged by a California State University Foundation panel. He is one of 23 winners. He was credited not only for academic achievement but also for involvement in campus groups and his ability to transcend difficulties, including economic hardship. Juarez feels his confidence “is unmatched” because of the challenges he’s faced, including adjusting to campus life and the rigorous course work of his major. He joined San Diego State’s Mathematics, Engineering, Science Achievement (MESA) program, to help, as well as other campus organizations. Now he is piling up honors within his field. He scored an internship at the Idaho National Laboratory will work with the campus Center for Sensorimotor Neural Engineering. He also supports programs to draw more students into science, technology, engineering and math (STEM) studies. His other community involvement includes Movimiento Estudiantil Chican@ de Aztlán (MEChA), the Society of Hispanic Professional Engineers and Latinos in Engineering and Science. Following his 2015 graduation, Juarez plans to further his interest in renewable energy by launching a business to develop sustainable products.